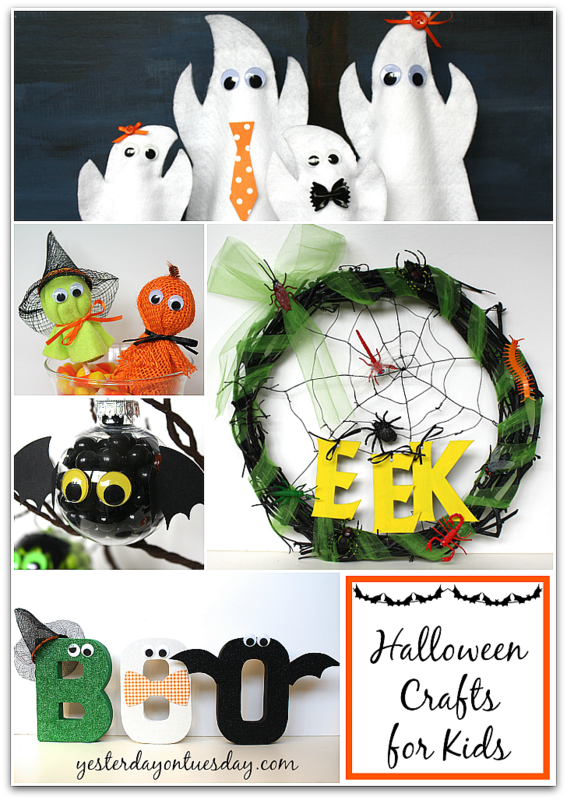 There are so many cool crafts that kids can create for Halloween! Materials: Feltables 36″ x 36″ White Felt, four “Make It: Fun” brand Styrofoam Cones (two 3 7/8″ by 8 7/8″ cones and two 2 7/8″ by 5 7/8 inch cones), googly eyes and embellishments like thin ribbon, scrapbook paper to make a tie, buttons and free ghost template (below). You’ll also need scissors, glue and a piece of cardboard or scrapbook paper to trace the templates on. All materials available at Ben Franklin Crafts and Frames in Redmond. 2. Trace templates on cardboard or card stock and cut out. 3. Trace templates on white felt and cut out (4 large and 4 small to create “fronts and backs” for all four ghosts). 4. Place one piece of felt on front of styrofoam cone and one on back. Gently tug until sides meet. Glue together. Repeat for other four ghosts. 5. Glue on google eyes and embellishments like thin ribbon (for mom and daughter ghosts) and paper necktie for father ghost). The son ghost’s bow tie can be made by coloring a piece of farfalle pasta black with a Sharpie or by painting it black. Materials for the Pumpkin: Orange Burlap, a brown chenille step, googly eyes, thin black ribbon, glue and a lollipop. Materials for the Witch: Green Felt, a tiny witches’s hat, googly eyes, orange ribbon, glue and a lollipop. All materials available at Ben Franklin Crafts and Frames in Redmond. 1. Using a small bowl as a template, trace the circle shape on the burlap or felt and cut out. 4. 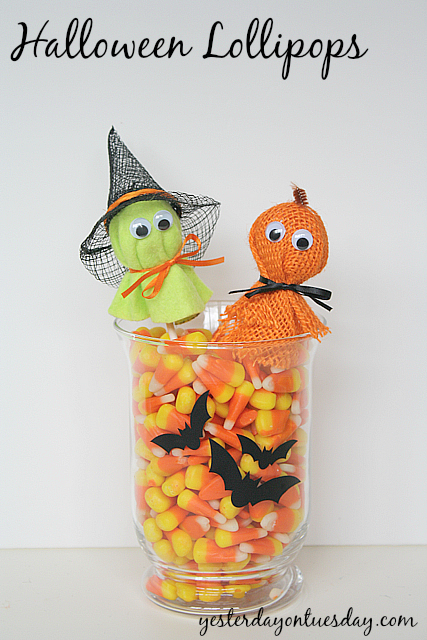 Display in a vase full of candy corn. Ours features vinyl bats by Decorating Your Life. 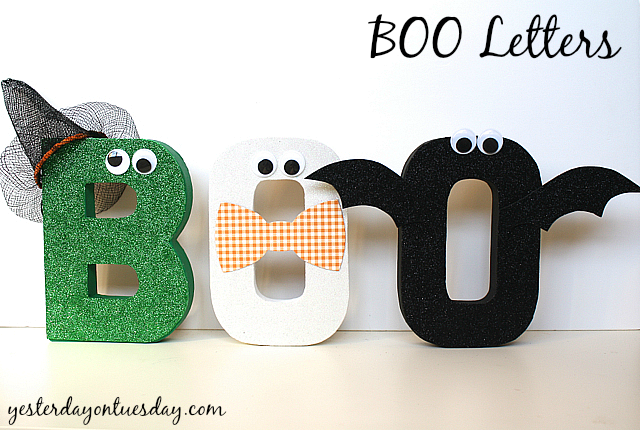 Materials: Large cardboard “BOO” letters, green, white and black adhesive glitter foam, green, white and black acrylic paint, large witches’s hat and 3 sets of large googly eyes. You’ll also need a pencil, scissors, glue and if desired, die cut bow tie for ghost. All materials available at Ben Franklin Crafts and Frames in Redmond. 2. Using photo as a guide, trace letters on “paper” side of adhesive glitter paper. 3. Cut out letters and adhere to cardboard letters. 4. Draw bat wings on a remaining black glitter paper and cut out. 5. Glue eyes, hat, bow tie and wings on letters. 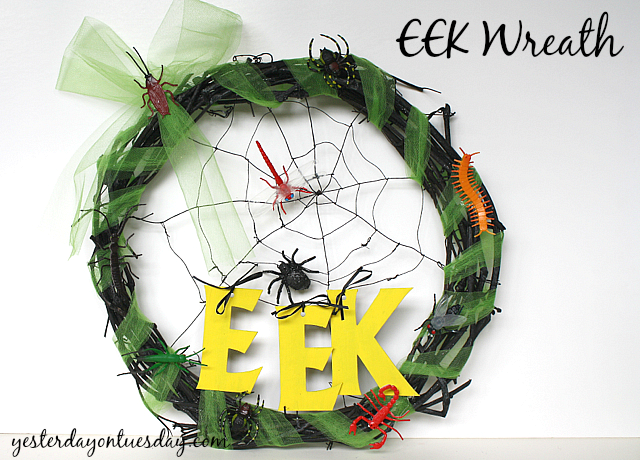 Materials: Black Spiderweb wreath, green tulle, large chipboard letters, yellow paint, a hole lunch, think black ribbon, a package of Creatures Inc. from Darice and glue. All materials available at Ben Franklin Crafts and Frames in Redmond. 1. Paint chipboard letters yellow (3-4 coats) and let dry. 2. Wind tulle in and out of wreath. Make a large bow in a corner. 3. Using the photo as a guide, glue on some creepy crawly bugs. 4. Punch a hole in the top of each letter and tie to the web with black ribbon. 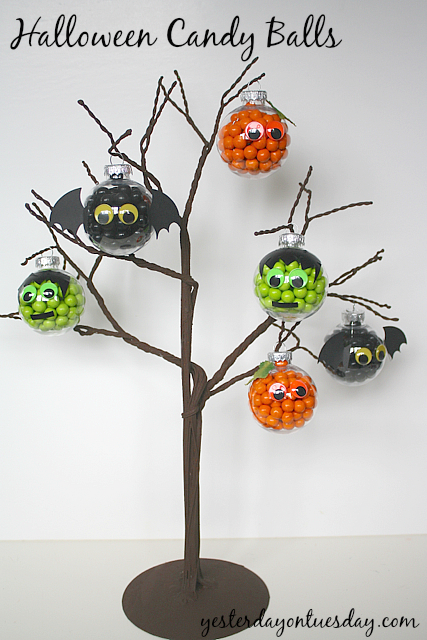 Materials: Plastic Christmas Ornaments, Sixlet Candy in green, orange and black, Neon Googly Eyes from Darice, black Duck Tape (for monster), small green leaves (for pumpkin), black card stock, glue gots and white chenille stem for bat. All materials available at Ben Franklin Crafts and Frames in Redmond. 1. Fill balls with candy (using photo as a guide). 2. Add corresponding colored eyes with Glue Dots. 3. Embellish (again using photo as guide). 4. These would be cute hanging on a single branch in a vase. Malia!!!! These are all so cute! Malia, I love these crafts!!! They are so super cute!! I love them!! P.S. I love your sprinkles organization on Uncommon Designs today!! Thank you Crystal, on both counts! 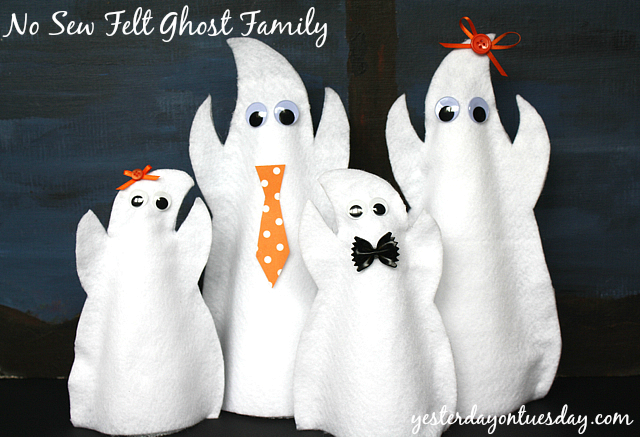 Adorable ideas, and the felt ghosts are the cutest! Sharing! Thanks Sharon, that’s a nice compliment to get, esp from an amazing crafter like you!